Pictured at the signing of the agreement are (l-r) Paul Trimble, Deputy Chief Pilot, Skywatch and Chris Kerr, Interim Chief Fire Officer, NIFRS. 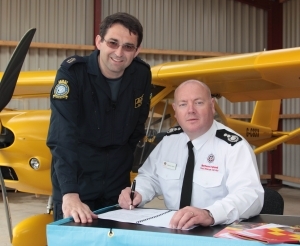 Northern Ireland Fire & Rescue Service (NIFRS) and the Police Service of Northern Ireland (PSNI) have signed important Memorandums of Understanding (MoUs) with Skywatch Civil Air Patrol relating to the tasking and coordination of volunteer aviation assets. The documents formalise procedures for the callout and use of their aircraft across a range of operations from wildland fires to long term missing person searches. “By signing these Memorandum of Understanding with Skywatch both agencies are committing to continuing to work closely with our partners in the voluntary sector to ensure the best possible response to a broad range of incidents in which the use of aviation resources could provide benefits including the possibility of saving lives”. Skywatch have invested considerable time, money and effort into preparing an aircraft and training staff to perform this valuable activity and their presence in the sky will become a regular feature of partnership operations in the coming months.